Cooking classes in South East Asia are an activity I have always wanted to try, but I have never found the time. Either I was traveling with friends who did not share my culinary interests, or I was jam-packing activities into a short travel itinerary. Luckily, for this trip, I am spending five weeks in Battambang, Cambodia, so I can try a bit of everything. I found Nary Kitchen through TripAdvisor and the local travel brochures. The restaurant is owned and operated by an adorable married couple, Toot and his wife Nary. As soon as I arrived, Toot greeted me with a compassionate and warm smile, and he expressed his gratitude for my attendance. He eagerly showed me the recipes we would cook for the day, and offered me a complementary cookbook to take home. 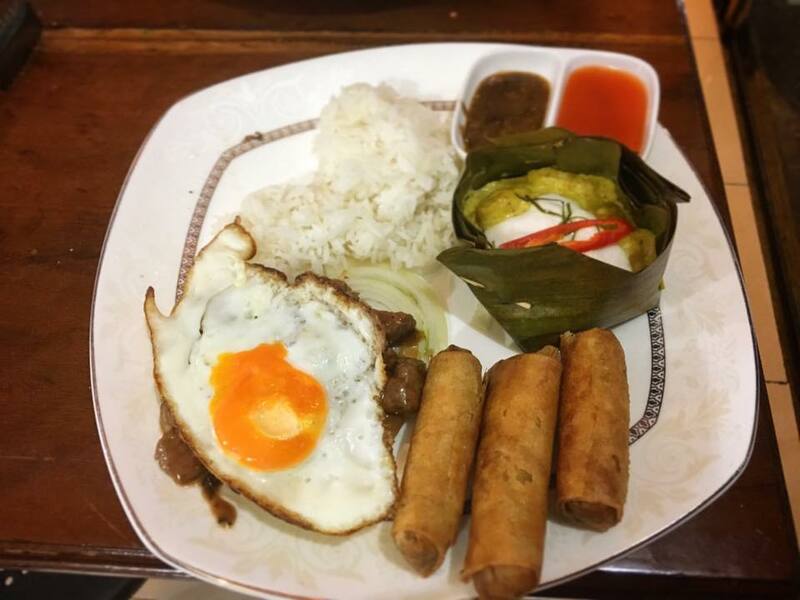 Immediately, I felt welcomed and excited to learn about Khmer cuisine. I am fortunate to be visiting Cambodia in February, as I was able to take pleasure in enjoying the cool breezes as I sat on the porch waiting for the other cooking classmates. I was later joined by a couple from Australia, and a group of older female travelers visiting from the UK. Once everyone arrived, our guide explained that we would first tour the market and collect the ingredients necessary for the day’s recipes. The market was a bustling place! Tuk-tuks and motor bikes zipped through the streets in a disorderly dance. Carefully, we zig-zagged between the traffic to reach the market. My senses were immediately heightened by the beautiful array of colors and unfamiliar smells. 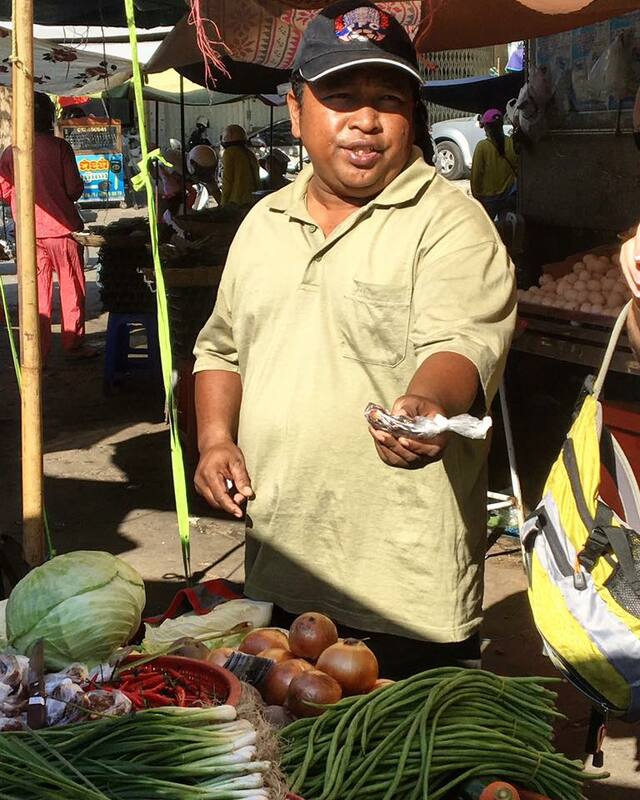 Our guide introduced us to some unfamiliar ingredients that are popular in Khmer cuisine. He showed us lemongrass, galangal, kaffir lime leaves, and turmeric which would all be used to make the curry paste for the fish amok. Next we were able to observe how fresh coconut milk is made. First one lady pounded the coconut with a knife to let the juices out. Then the coconut was put into a machine where the milk was extracted and the white bits were shaved into a dry pulp. After obtaining all of our ingredients, it was time to head to the kitchen and cook. On the menu, we would be making 1. Fish Amok, 2. Beef Lok Lak, 3. Fried Vegetable Spring Rolls, and 4. Banana Tapioca with fresh coconut milk. First we started with the Fish Amok. In this dish snake fish is steamed in a banana leaf in a paste made with lemongrass, garlic, galangal, kaffir lime leaves, fresh turmeric, cane sugar, salt, fish paste, and coconut milk. The chef demonstrated how to grind the paste. Using a motor and pestle, we painstakingly crushed the ingredients until it was fine and mushy. Once our paste was complete, we cut the snake fish into small cubes and stirred it in with the paste and coconut milk. Luckily the fish had already been deboned, so no advanced butchering skills were required. Finally, the chef showed us how to fold the banana leaves into a box shape. Then we filled the box with chopped spinach covered by the marinated fish. The second dish we prepared were the vegetable spring rolls. For this dish we used chopped green onion along with grated tarot and carrot. Rolling the spring rolls was a bit tricky for me, and each of mine ended up being a slightly different size. However they were rolled well enough to stay together in the fryer, so I was pleased with the result. The third dish we prepared was the banana and tapioca dessert. We chopped the banana into four equal pieces and boiled it in water along with the dried tapioca balls. Later we added sugar and count milk and let the mixture reduce. We also added a dash os salt to bring out the sweetness and banana taste. The final dish we prepared was Beef Lok Lak. This dish was exciting to cook, because we were able to cook with fire. I am a huge fan of shows like Chopped and Master Chef, so I am enticed by flambéing food. First we marinated the beef in ketchup, soy sauce, oyster sauce, soy sauce, sugar, black pepper, and garlic. Next, we prepared garnishes of lettuce, tomato, and white onion. The chef helped us prepare a simple design for presentation. He comically placed the onions to look like a wifi signal. I am not sure if Gordon Ramsy would approve of this presentation, but we had fun with it nonetheless. We also prepared a fried egg to later top the beef. After our plates were ready, it was time to cook with fire! One by one the chef guided us set the beef on fire using rice wine. It was a rush to simultaneously stir the beef as flames engulfed the pan. Finally we deglazed the pan with lime juice and black pepper to make a delicious dipping sauce. Not only did I enjoy the delicious food and experience of cooking in a Khmer kitchen, but also the chef was really open towards talking to the group about his personal life, giving us insights into Khmer culture. Our chef was middle aged, maybe mid 40’s, so he had been a victim of the Khmer Rouge. He told us about losing his father, and trying to rebuild his life after the regime ended. He learned English by driving a tuk-tuk. He said how we are so lucky to be able to travel as we wish, because it is much harder to achieve a visa as a Cambodian. His tales really made me reflect about how fortunate I am to have the opportunity to travel. I highly recommend Nary Kitchen to anyone visiting Battambang. 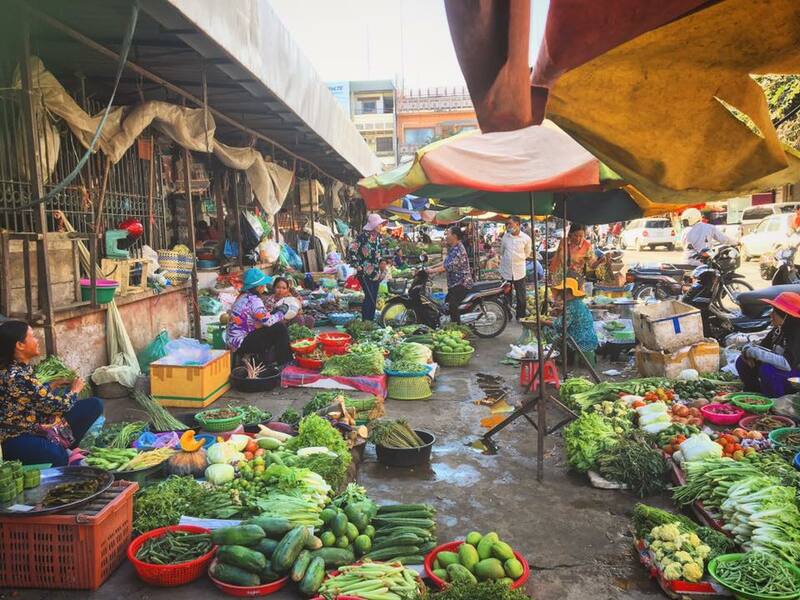 Not only will you learn to cook delicious Khmer dishes, but you will take home memories of Cambodian hospitality and culture. If you want to see some video footage of what it is like to cook at Nary Kitchen, click the video below!